What if I told you there's a new, RWD, German sedan with a manual transmission, sport-tuned suspension, turbocharged four-cylinder engine, near perfect 50/50 weight distribution, and 18-inch wheels that you could get for $34,745 with the destination? Here's the six-letter order code you need to get just that. Because BMW has Mini Cooper and the 1-series is only available as a coupe here, there's a gap between their FWD and RWD offerings that no vehicle fills the same way the CLA will for Mercedes or the ES350 does for Lexus. Also, BMW doesn't build a FWD car here yet. Good for BMW. If you want a pure, RWD driving experience you could get a BRZ but that's hardly in the class of a BMW and there's no sedan. In order to fill this whitespace, BMW offers what may be the best performance deal you're going to find with any European luxury car (or Japanese for that matter). 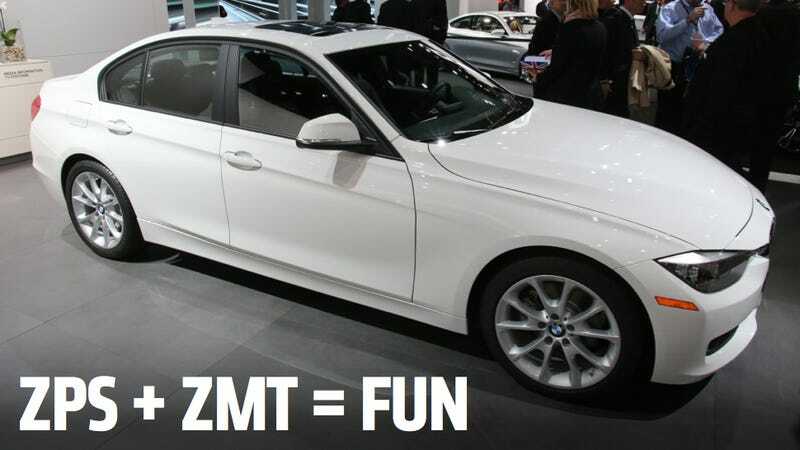 Enter the BMW 320i ZSP + ZMT. The new base 3-series sedan is the 320i, which offers a turbocharged 2.0-liter engine with 180 horsepower and 200 lb-ft of torque. Not earth-shattering power, but it's still the benchmark for handling and performance in the realm of luxury sedans. Typically, European carmakers like to add the options on to encourage you to spend way over MRSP (in this case $33,445 for a base 320i) but BMW told me they wanted to offer an affordable performance package for the kind of enthusiast-oriented drivers that made BMW famous in the first place. That's where those first three letters come in. ZSP gets you everything mentioned above, including the high performance summer tires, M sport suspension, increased speed limiter, 18-inch alloys, and Anthracite headliner. Pair that with ZMT, which means 6-speed manual transmission, and you're getting all of the go-fast stuff you want without all of the heavy options you don't. The total cost? $1,300 over MSRP, which equals $34,745. Not a bad deal. The 320i goes back to the very essence of the 3 Series. It’s a true Sports sedan that embodies BMW’s intelligent approach to performance; that’s to say through the use of both a great engine and an advanced chassis that offers sharp handling and response in all situations. The Sport package echoes this positioning, with its simple, yet comprehensive attributes. It combines athletic design elements as well as dynamic drivetrain components to further enhance the driving experience… Equipped with the Sport Package, the 320i is even more of a homage to cars like the 2002ti; it is a very versatile car that can handle pretty much anything a driver might expect from his car, but its primary focus is on pure, simple driving pleasure. That's a sporty, RWD sedan with 50/50 weight distribution, a manual transmission, 36 mpg on the highway, and a turbocharged engine. Is there anything new that beats that?